ENTER THE BRISK TEA INSTANT WIN GAME #USA. NO PURCHASE NECESSARY. Legal U.S. residents 18+. Void where prohibited by law. Ends 12:00PM PT on 9/6/17. See Official Rules. Sponsor is Pepsi-Cola Company 700 Anderson Hill Road, Purchase New York 10577. ©2016 BRISK is a registered trademark of the Unilever Group of Companies. This Promotion and all accompanying materials are ©2017 Live Nation Entertainment, Inc. All rights reserved. This Game is in no way sponsored, endorsed or administered by, or associated with, Facebook, Twitter, Instagram, Shazam or any other social network or platform. You understand that you are providing your information to Game Entities (as defined below), and not to, Facebook, Twitter, Instagram, Shazam or other social network or platform. 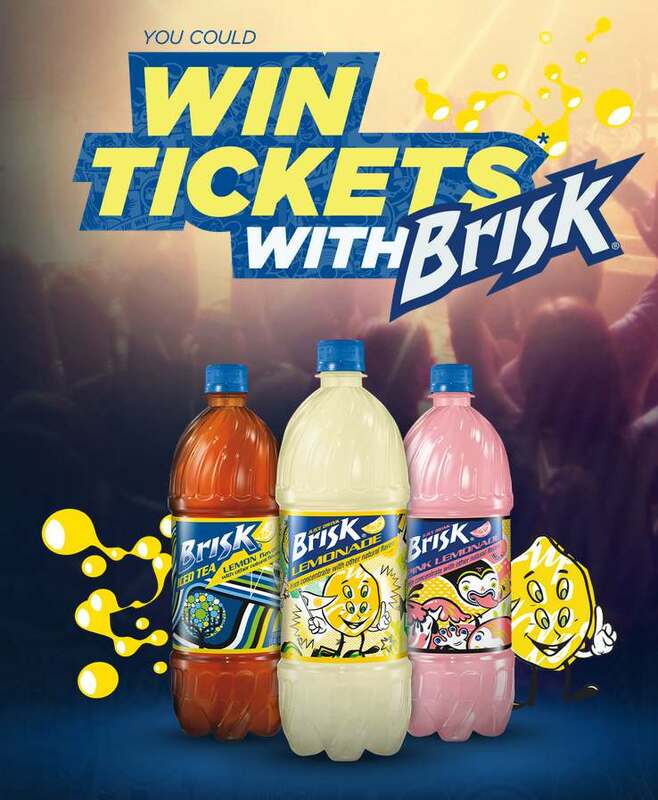 Eligibility: The Brisk Tea Instant Win game (“Game”) is open only to natural persons who are legal residents of United State of America, who have a valid social security or tax ID number, who are at least eighteen (18) years of age, and who have a valid email account at the time of entry. Game may only be entered from and in eligible jurisdictions. Game Entities, prize providers, and each of their parent, subsidiary and affiliate companies, employees, agents and suppliers, as well as the immediate family (spouse, parents, siblings and children) and household members of each such employee are not eligible to participate. In the event of a dispute as to the identity of an entrant, the authorized account holder of the email account at the time of entry will be deemed to be the entrant (“Entrant” or “You”). Administrator may request any potential winner to provide proof that such person is the winner. All potential winners are subject to verification before any prize will be awarded. Subject to all applicable laws and regulations. Void where prohibited. Participation constitutes entrant’s full and unconditional agreement to these Official Rules and Administrator’s decisions, which are final and binding in all matters related to the Game. Winning a prize is contingent upon fulfilling all requirements set forth herein. Sponsor: The Sponsor of the Game is Pepsi-Cola Company (“Sponsor”). Administrator: The administrator of the Game is Live Nation Marketing, Inc. (“Administrator” also known as “Live Nation”). Sponsor and Administrator are collectively referred to herein as “Game Entities”. Timing: The Game period begins at 12:00 PM Pacific Time (“PT”) on May 22, 2017 and ends at 12:00 PM PT on September 6, 2017 (“Game Period”). Administrator’s clock is the official time keeping device of the Game. How to enter: There are two ways to enter. To Enter via Shazam, an Entrant must have the Shazam mobile application downloaded on his or her mobile device. If an entrant does not have the Shazam mobile application, the entrant must visit www.shazam.com/apps to download the application. To submit an entry (“Entry”/“Game Play”) for the Game, using the Shazam mobile application, an Entrant must scan a bottle or can of Brisk Iced Tea at any retailer that sells Brisk Iced Tea during the Game Period and follow instructions on the Brisk Iced Tea Instant Win registration page to enter the Game. No purchase necessary. For the avoidance of doubt, once a bottle or can is scanned, Entrant will be taken to the Game registration page located at www.ticketmaster.com/brisk. The use of the Shazam platform is subject to its terms and conditions and Game Entities have no responsibility with respect to such use. This Game is in no way sponsored, endorsed or administered by, or associated with, Shazam. You understand that you are providing your information to Game Entities, and not to Shazam. Shazam does not charge for entry or require registration but you may incur other charges such as data rates from your data service provider according to the terms in your Service Plan. Check your plan for details. If you are a minor under the law of your jurisdiction of residence, you must have permission of your parent or guardian to enter the Game using the mobile application. To enter without using Shazam: Visit www.ticketmaster.com/brisk to enter without using Shazam. Entrant will be asked to provide basic contact information including name, email address, and mailing address. Entrant must be the registered subscriber of the email account from which the Entry/Game Play is made. For all entries regardless of method of entry: Each Entrant is eligible to submit one (1) Game Play/Entry per person per day during the Game Period, regardless of method or combination of methods of entry or number of entries submitted. Multiple Entrants are not permitted to share the same email address or other relevant account. Any attempt by any Entrant to obtain more than the stated number of plays/entries by using multiple/different email addresses, identities, registrations, and logins, or any other methods will void that Entrant’s plays/entries and that Entrant may be disqualified. Use of any automated technology or system to participate is prohibited and will result in disqualification. Any automated receipt (such as one confirming delivery of text message or e-mail) does not constitute proof of actual receipt by Administrator of an entry. Game Entities are not responsible for lost, late, incomplete, invalid, unintelligible or misdirected registrations, which will be disqualified. All entries become the property of Administrator and none will be acknowledged or returned. Grand Prizes: One Hundred Fifty (150) One Hundred Dollar ($100) Ticketmaster Ticket Cash™ codes (“Codes”). Approximate Retail Value of each Grand Prize is: One Hundred Dollars ($100). First Place Prizes: Two Thousand (2,000) Fifty Dollar ($50) Codes. Approximate Retail Value of each First Place Prize is: Fifty Dollars ($50). For all prizes: Odds of winning a prize depend on the number of eligible entries received. There will be only one (1) prize per each winner during the Game Period. Lost or stolen prizes will not be replaced. Prize does not include any other item or expense not specifically described in these Official Rules, and any such additional expenses are the sole responsibility of winner. Prizes may not be transferred or assigned. Only listed prizes will be awarded and no substitutions or cash equivalents or redemption will be made, except that Administrator reserves the right to award a prize of equal or greater financial value if any advertised prize (or any component thereof) becomes unavailable. Winners agree to accept the prize “as is”, and entrants hereby acknowledge that Game Entities have neither made nor are in any manner responsible or liable for any warranty, representation, or guarantee, express or implied, in fact or in law, relative to the prize, including express warranties (if any) provided exclusively by a prize supplier that are sent along with the prize. Any valuation of the prize stated above is based on available information provided to Administrator and the value of any prize awarded to a winner will be reported for tax purposes as required by law. Each winner is solely responsible for reporting and paying any and all applicable taxes. Each winner must provide Administrator with a valid taxpayer identification number or social security number before any prize will be awarded. Selection and Verification of Potential Winners: There will be pre-selected, random, computer-generated winning timestamps during the Game Period. If you are the first player to play the Game at or after one of the pre-determined, randomly generated timestamps (“Play”), you will be a potential instant winner of the Game Prize indicated. Administrator’s decisions as to the administration and operation of the Game and the selection of potential winners are final and binding in all matters related to the Game. Administrator reserves the right to disqualify any participant or winner and may refuse to award any prize to a person who is ineligible or has violated any rule, gained unfair advantage in participating in the Game, or obtained winner status using fraudulent means. All potential winners are subject to verification by Administrator. Administrator will not accept screen shots or other evidence of winning in lieu of its validation process. Any Play that occurs after the system has failed for any reason is deemed a defective Play and is void and will not be honored. Potential winners must continue to comply with all terms and conditions of these Official Rules, and winning is contingent upon fulfilling all requirements. Each potential winner will be notified by email. Each potential Game Prize winner may be required to sign and return an Affidavit of Eligibility and Liability/Publicity Release (except where prohibited), which must be received by Administrator within seventy-two (72) hours of the date notice or attempted notice is sent, in order to claim a prize (if applicable). If a potential winner of any prize cannot be contacted, fails to sign and return the Affidavit of Eligibility and Liability/Publicity Release within the required time period (if applicable), declines the prize or prize is returned as undeliverable, such potential winner forfeits the prize. In the event that a potential Game Prize winner is disqualified for any reason, Administrator will add the un-awarded prize back into the prize pool on the following day. At the end of the Game, any prize that is not claimed by a qualified winner will remain un-awarded. Problems With Receipt Of Game Prize: If you have not received your Game Prize via email within seventy-two (72) hours after receiving a winning message, please check to make sure that Game Prize is not in your Bulk or Spam Mail folder. If you still have not received Game Prize, please call Live Nation Fan Support at (800) 653-8000 during the following hours (local time): Monday-Friday: 9 AM – 9 PM; Saturday: 9 AM – 8 PM; and Sunday: 9 AM – 6 PM. Return of a prize or prize notification as undeliverable, or inability of Administrator to contact a potential winner by email within seventy-two (72) hours after receiving a winning message, may result in disqualification of such potential winner, and an alternate winner may be selected at Administrator’s discretion. Publicity: Except where prohibited, participation in the Game constitutes winner’s consent to Game Entities’ use of winner’s name, social media identity, likeness, photograph, voice, opinions, and/or city of residence for promotional purposes in connection with this Game in any media, worldwide, and without further payment or consideration. Errors and Unauthorized Activity: Game Entities are not responsible: (1) for any incorrect or inaccurate information, whether caused by entrants, printing errors or by any of the equipment or programming associated with or utilized in the Game; (2) for technical and/or communications malfunctions, errors or failures of any kind; (3) for unauthorized human intervention in any part of the Game; (4) for technical or human error which may occur in the administration of the Game or the processing of entries; (5) for any injury or damage to persons or property which may be caused, directly or indirectly, in whole or in part, from entrant’s participation in the Game or receipt or use or misuse of any prize; or (6) if the Game cannot take place or if any prize cannot be awarded due to acts of war, natural disasters, weather, or acts of terrorism. If for any reason an entrant’s entry is confirmed to have been erroneously deleted, lost, or otherwise destroyed or corrupted, entrant’s sole remedy is another entry in the Game, provided that if it is not possible to award another entry due to discontinuance of the Game, or any part of it, for any reason, Administrator, at its discretion, may elect to hold a random drawing from among all eligible entries received up to the date of discontinuance for any or all of the prizes offered herein. No more than the stated number of prizes will be awarded. In the event that production, technical, seeding, programming or any other reasons cause more than stated number of prizes as set forth in these Official Rules to be available and/or claimed, Administrator reserves the right to award only the stated number of prizes by a random drawing among all legitimate, un-awarded, eligible prize claims. Administrator reserves the right to cancel, suspend and/or modify the Game, or any part of it, if any fraud, technical failures or any other factor beyond Game Entities’ reasonable control impairs the integrity or proper functioning of the Game, as determined by Administrator in its sole discretion. In such event, Administrator reserves the right to award the prizes at random from among the eligible entries received up to the time of the impairment. Administrator reserves the right, in its sole discretion, to disqualify any individual it suspects or finds to be tampering with the entry process or the operation of the Game or to be acting in violation of these Official Rules or any other Game or in an unsportsmanlike or disruptive manner. Any attempt by any person to deliberately undermine the legitimate operation of the Game may be a violation of criminal and civil law, and, should such an attempt be made, Game Entities reserve the right to seek damages from any such person to the fullest extent permitted by law. Game Entities’ failure to enforce any term of these Official Rules shall not constitute a waiver of that provision. Release: By participating, entrant (a) releases and holds harmless Game Entities, prize providers, Game agencies, franchisees, and each of their respective parent companies, affiliates, subsidiaries, successors, assigns, agents, representatives, officers, directors, shareholders, and employees (collectively, the “Released Parties”), from any and all liability for any claims, costs, injuries, death, losses or damages of any kind to the entrant or any other person, resulting in whole or in part, directly or indirectly, from acceptance, possession, use or misuse of any prize, participation in the Game, any breach of the Official Rules, or in any Game prize-related activity. The entrant agrees to fully indemnify Released Parties from any and all claims by third parties relating to the Game, without limitation, including the unauthorized or illegal access to personally identifiable or sensitive information or acceptance, possession, use, misuse, or nonuse of the prize that may be awarded; (b) acknowledges that said Released Parties have neither made nor are in any manner responsible or liable for any warranty, representation or guarantee, expressed or implied, in fact or in law, relative to a prize including, without limitation, the prize quality or availability; and (c) waives any rights to claim ambiguity with respect to these Official Rules. Disputes: As a condition of participating in the Game, entrant agrees that: a) under no circumstances will entrant be permitted to obtain awards for, and entrant hereby waives all rights to claim, punitive, incidental, consequential, or any other damages, other than for actual out-of-pocket expenses; b) all causes of action arising out of or connected with this Game or the prizes awarded, shall be resolved individually, without resort to any form of class action, exclusively by arbitration pursuant to the Rules of the American Arbitration Association, then effective; and c) any and all claims, judgments, and awards shall be limited to actual out-of-pocket costs incurred and in no event shall entrant be entitled to receive attorneys’ fees or other legal costs. Game Entities reserve the right to modify prize award procedures. The Game and these Official Rules, and the validity, construction, performance, and enforcement thereof, shall be governed by and construed in accordance with the laws of State of California, without giving effect to any choice of law or conflict of law rules (whether of the State of California or any other jurisdiction), which would cause the application of the laws of any jurisdiction other than the State of California. WINNER’S LIST: To obtain a list of the names of winners of prizes with a value greater than $25, mail your request and a self-addressed, stamped envelope, up to sixty (60) days after the close of the Game, to Brisk Iced Tea Instant Win Game WINNERS LIST, c/o Live Nation Worldwide, Inc., 7060 Hollywood Blvd., Hollywood, CA, 90028, Attention: Sweeps Dept. The Game and all accompanying materials are © 2017 Live Nation Worldwide, Inc.
Live Nation, Ticketmaster, and Ticketmaster Ticket Cash are trademarks of Live Nation Entertainment, Inc.